On Friday June 15th 2012 we were at the Faith Lutheran Church in Butler Pennsylvania. The event was a wedding reception for The Reverend and Mrs. Brian and Bethanie Westgate. 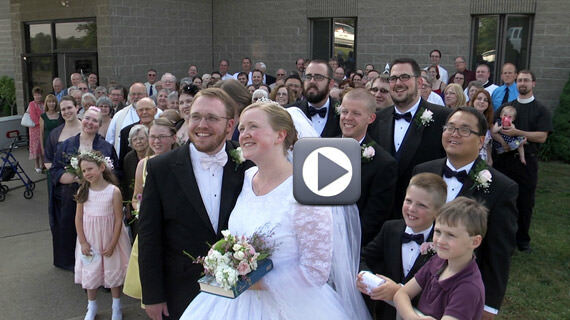 Betsy and Brian were married in a 4:00 pm wedding ceremony at Faith Lutheran Church. After the ceremony guests enjoyed appetizers which were prepared by the staff at Thompson’s Country Market & Catering in West Sunbury PA. During this time, the bridal party posed for photos with Steven Dietz of Sharp Image Studios. At 7:00 pm guests enjoyed a buffet dinner and then danced the night away to the music which was provided by DJ Pifemaster. The wedding reception lasted until 10:00 pm.